Over-vaccinating, combined with stress, poor nutrition and other factors, is putting our companion animals at risk for serious diseases including autoimmune disorders, cancer or even death. 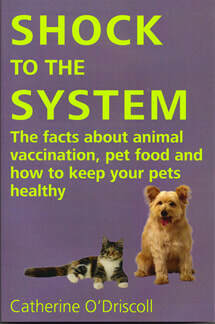 In this well-written and carefully researched book you will discover how typical vaccination protocols combined with environmental and genetic factors may be combining to turn your dog, cat or horse into a ticking time-bomb of health problems. In Shock to the System you will learn how to avoid these health problems by better management of vaccination schedules, reducing stress in the lives of our animals, and optimising health with diet.